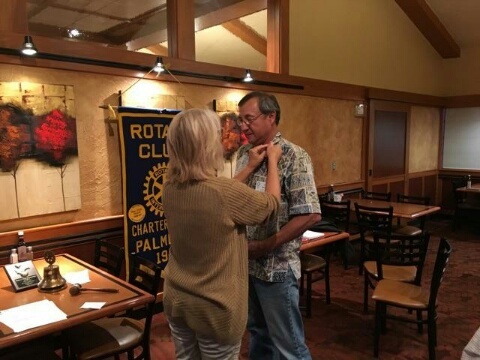 At their April 20th regular Wednesday meeting, the Rotary Club of Palmdale honored John Martinez as their newest Paul Harris Fellow. John’s recognition as a Paul Harris Fellow brings the club’s total to nine. All beginning 2015-2016 club members are now Paul Harris Fellows. 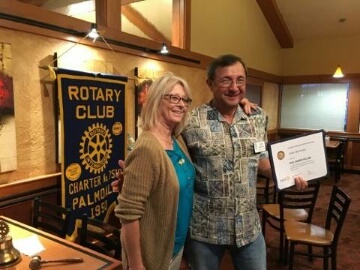 In the photos below, President Sharon Freeman presents John with his pin and recognition certificate. The club’s three new are looking forward to becoming Paul Harris Fellows in the near future. 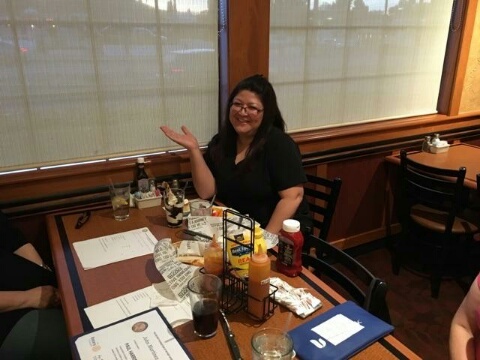 In addition to pinning a new Paul Harris Fellow, the club celebrated former President Rosana Budd’s birthday during the meeting. Rosana was club President in 2013-2014.